Office holiday party: What to wear without trying too hard. Office holiday party season is here and here is a perfect outfit to wear without trying too hard. I love the idea of a fun skirt that is still work function appropriate so I chose this midi pleated skirt and paired it with a turtleneck. I love turtlenecks during this time of the year as they are perfect for layering. See how I recently styled one HERE. I am wearing a bodysuit version which like a regur bodysuit gives the body a seamless frame. The Closet Camo Print Pleated Skirt is currently on SALE for $58. Depending on the weather, you can wear a coat or a blazer over the turtleneck. My PrettyLittleThing basic roll neck long sleeve body in black is available for $19. 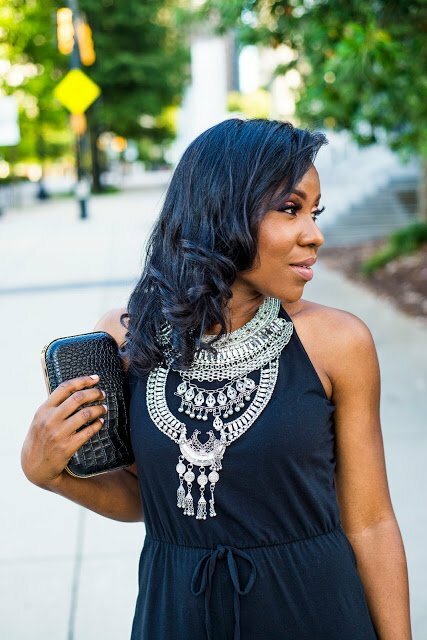 Wear a necklace or layered pieces like I did HERE. The slit is just above the knee so perfectly okay if you’re on the conservative side. I absolutely adore the Clara Bow flats by Tory Burch. It runs true to size and it is comfortable. I have narrow feet if that is helpful. I love that is made with velvet and the color is perfect for Fall/Winter. Snag them before they sell on, currently marked down to $229. Looking for a classic belt that you can wear year-round, I highly recommend this Gucci belt. I bought a longer strap option so I can wear it in different ways. Thank you for reading and enjoy the rest of your day! Please don’t forget to SUBSCRIBE to the blog if you enjoy my content.